July 13, 2005, LG Crabo. 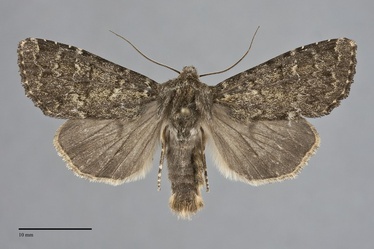 Apamea zeta is a medium-sized moth (FW length 16–21 mm) with a greenish gray forewing that flies above timberline north of central Washington. The forewing is relatively broad, with an elongate apex and slightly scalloped outer margin. The color is dark powdery green-gray, slightly darker along the costa and in the median area due to a diffuse median line. The lines are dark gray, double with lighter yellow-green to gray-green filling. The basal and antemedial lines are slightly irregular. The latter line is angled across the wing with a long tooth toward the margin on 1A+2A near the posterior margin. The postmedial line is strongly toothed, strongly drawn toward the base on the costa, bent abruptly below the costa and oriented obliquely across the wing with a slight convex segment around the reniform spot. The subterminal line is pale, similar to the filling of the other lines, irregular with a weak W-mark on the mid-wing. It is preceded by a variable gray shade, continuous or forming a series of dark wedges on the mid-wing. The terminal line is a series of lines or triangles between veins. The fringe is checkered, green gray and yellow. Th orbicular spot is variable, absent or a circle or oval weakly outlined in gray with filling of the ground color or slightly lighter gray-green. The reniform spot is kidney-shaped, weakly outlined in white to cream laterally and gray elsewhere, and is filled with the ground color medially and light yellow-green laterally. The claviform spot is absent or weak dark gray. The hindwing is tan-gray with a slight sheen, darker gray toward the outer margin, with gray small discal spot, veins, and terminal line. The hindwing fringe is yellow-gray off-white. The head and thorax are powdery greenish gray. This species can be identified by its powdery dark green-gray forewing with light-filled reniform spot and scalloped lines. It is unlikely to be confused with any other moth in its alpine habitat. Some central Rocky Mountain populations of A. zeta, including in the Uinta Mountains of northern Utah, are smoother brick-red and gray rather than greenish. Specimens resembling these could potentially occur in eastern Idaho. This species is highly variable elsewhere in North America with five recognized subspecies. Of these, only A. z. nichollae occurs in our area. The type locality of the synonym Protagrotis nichollae Hampson, currently considered to be a subspecies of A. zeta, is Simpson River, British Columbia, Canada. This species occurs in arctic and alpine tundra habitats. In our region it is found on alpine tundra at high elevations in the mountains. Apamea zeta is found in mountains throughout British Columbia, ranging south to the northern Cascade Mountains in Washington. It has also been collected in the Selkirk Range in far northeastern Washington. This species is likely to occur at high elevations in the Rocky Mountain system in Idaho and Montana. This species is Holarctic and occurs around the world, including on Greenland. In North America it ranges across the continent in arctic and subarctic areas from Alaska, the Canadian Arctic Archipelago, and Labrador. The range extends south in the Rocky Mountains through the Northwest and Alberta to Colorado. In the east it occurs south to the Gaspée Peninsula, Quebec. 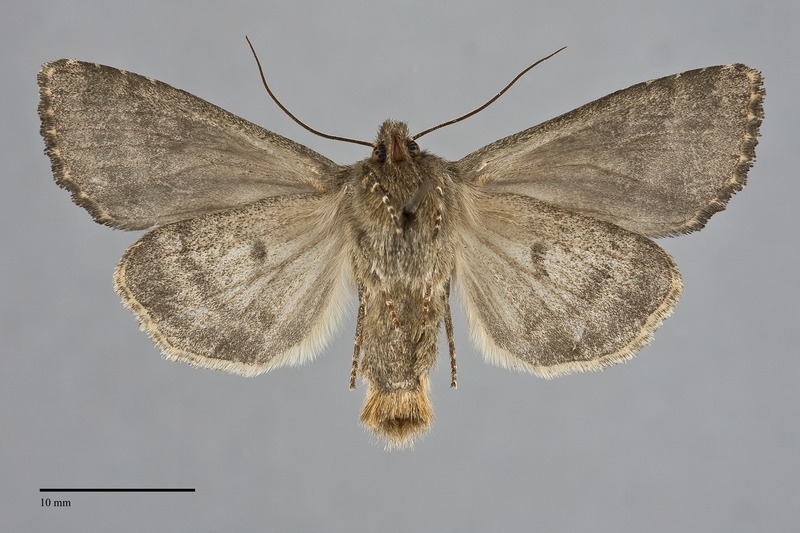 This species is a soil-surface feeding cutworm that feeds on grasses (Poaceae), particularly Festuca bunchgrasses in tundra habitats. This species flies during the summer, usually in July and August. As with other alpine moths the season is dependent on the timing of the snow melt. A. zeta is nocturnal and comes readily to lights.